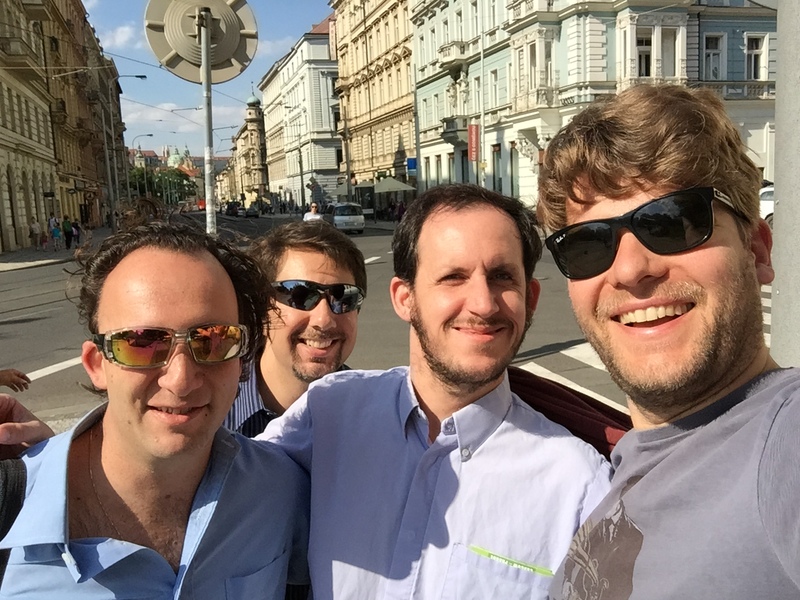 Band Selfie in Prague! But where’s Fin? I can’t believe the Tour of Awesome™ is over. Paromita and I are sitting in Schiphol Airport in Amsterdam waiting for our flight to Toronto so I’m blogging away, courtesy of the free Wi-Fi. The “unfinished business” of the title of this post has to do with KlezFactor’s next album, Europa (now in progress). Its genesis dates back to the end of 2012 when I was getting ready to leave Berlin for Toronto. After playing with some pretty amazing musicians (and people), I wanted to record the next KlezFactor album in Europe with the European band. Alex Bayer was playing bass, Florian von Frieling was on guitar, Finlay Panter and Daniel Praetzlich were playing the drums and Dea Szucs was on violin. It took me close to three years but I’ve finally managed to get the ball rolling on Europa. While the concept of the album changed (more accurately, I dropped the idea of having a concept in favour of the “I need lots of music so where can I get it from” approach), the desire to capture that European band in action was the impetus for the whole Europa tour and recording sessions. While Daniel Praetzlich isn’t living in Berlin anymore, Fin “Drooms” Panter was and the Liverpudlian was game for any time signature we threw at him. This album features tunes in seven and nine while our sets also regularly involved “Bulgarian Dance (Kopanitsa)” in 11. Alex “Cosmo” Bayer provides the pulse of the band. Splitting his time between Nuremburg and Berlin, Alex claims to not play electric bass very much (playing mostly double bass) but his funkiness can’t be denied and he was a major part of the band’s ability to gel quickly, learning difficult music and keeping solid time. I first met Florian von Frieling at the jazz jam at B-flat jazz club a few years ago. What stood out most was his ability to listen and respond to the other musicians. Flo’s sensitivity and technical prowess has endeared him to me and his excitement over the tour and the music, in spite of taking him away from his young son, helped the band through a hectic week. Finally, we were fortunate to get the very busy Daniel Weltlinger on violin with Dea away this summer. Hailing from Australia, Daniel is a European at heart and has moved to Berlin to play music with all kinds of fantastic musicians in a wide array of different styles. Daniel was able to provide a Yiddish flavour to KlezFactor’s tour and rocked out when called upon! This band is the heart of Europa but I would be remiss if I didn’t mention the Herculean work of Christian Betz, the recording engineer behind Berlin Audio. Christian was recommended to me by Canadian-born saxophonist Peter van Huffel and bringing Christian on board for the recording was one of the best choices. He wasn’t phased by our live recording on a very strange stage at Blue Note in Dresden and he was able to produce incredible-sounding results when we ended up recording the “studio” sessions at the very same club the next day. I think that when you start to hear bits of the album, you’ll be amazed at the clarity and warmth of the sound that he got from the band. Capturing this band on a recording has been the unfinished business that I’ve had in Europe for the past two-and-a-half years. Organizing, performing, and recording on this tour has been extremely rewarding and I can’t wait to dig into the tracks for mixing, editing and maybe a few more overdubs (it’s not a KlezFactor recording without a little bit of extra percussion)! It’ll take a little bit of time but I think KlezFactor: Europa is going to be our best album yet. With eight new compositions and maybe a couple of live versions of some old favourites, the recording captures a band of stellar musicians that came together over a week in Germany and the Czech Republic. Stay up to date with KlezFactor by “liking” us on Facebook! ← Previous Previous post: And We’re Off!